While the hymns of the day do mention the blessed doubt of Thomas which led to his fully believing in Jesus as Christ, doubt does not automatically lead to faith. 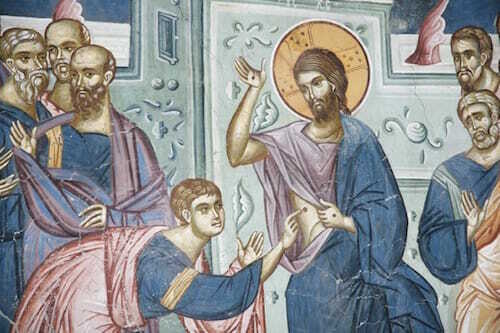 Jesus reproaches Thomas for his faithlessness, but doesn’t reject him. The 7th Century St. Isaac of Nineveh notes there is a downside to doubt. Peter wept bitterly for his faithless denial of Christ. Yet doubt does not mean absolute rejection of Christ. It is a normal part of being human. It can be healthy for us, as Thomas demonstrated, but we need to use it to lead us to Christ rather than allowing ourselves to become foolish cynics. We often have to wrestle with our own thoughts on our way to God’s Kingdom. In His desire to save people, Christ suffered everything: mocking and scourging, torture and shameful death, and even others poking at His wounds with their fingers after His glorious resurrection. If He is awaited, Christ will even go through closed doors (John 20:26). But what will He hear having entered our heart? Will He hear from us the words “my Lord and my God” or will He only receive mocking and scourging? Will we worship Him, as did St. Thomas, or will we crucify Him with our lack of repentance and hurl the rocks of our sins at Him?